Ricardo Lopez Jr. resides in the coverage crater. He can’t receive reduced-cost health coverage under the Affordable Care Act, because he doesn’t make enough money to qualify for its tax credits or cost-sharing subsidies. But he makes too much money to qualify for Medicaid. As a result, Lopez is one of the estimated 130,000 uninsured Oklahomans who won’t benefit from the next phase of Obamacare. 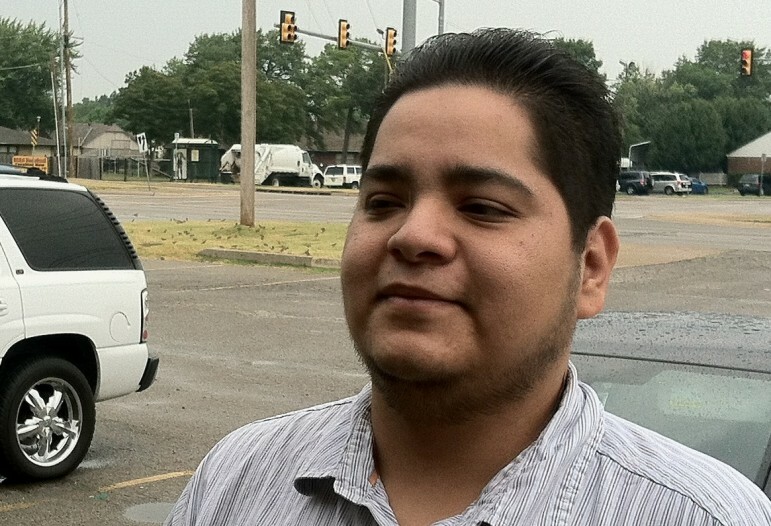 Lopez, 30, is a full-time legal assistant at a small law firm in Tulsa. The firm doesn’t offer health insurance to its employees. He said his annual income is about $25,000. Lopez has four boys and a girl at home, ages 3 months to 15 years. His 31-year-old wife, Diann, is a full-time mother. The five children are covered by Oklahoma’s version of Medicaid, called SoonerCare, but Lopez and his wife have too much income to qualify. So they get by without insurance. Lopez is a diabetic. He goes to a free clinic every month to refill his prescription for Metformin and another diabetes medication. He pays $4 per month for each prescription. “I haven’t really gone to the doctor,” he said. The Lopezes fall below the federal poverty line for a family of seven. When the Affordable Care Act was signed into law in 2010, people like them were supposed to be covered by a nationwide expansion of Medicaid. The Supreme Court struck down that portion of the law, saying the federal government couldn’t force states to expand their Medicaid programs. Oklahoma refused to do so. Lopez and his wife can still buy insurance through the health-care law’s online marketplace. But they would have to pay the full rates charged by participating insurance companies. The tax credits and subsidies are available only to people with incomes above the poverty level. According to the Kaiser Family Foundation, it would cost Lopez an estimated $286 a month to buy a “silver”-level plan for himself in the federally run marketplace. A cheaper “bronze” plan would cost $237 a month. Because his wife is a year older than he, a silver plan would cost her $292 a month and a bronze plan $242. Lopez said it would be difficult for him to pay that much for insurance, although he didn’t rule it out completely. But there may be a silver lining for the Lopezes. The state runs a separate program called Insure Oklahoma, which provides health insurance to about 30,000 working people who satisfy certain income and employment criteria. It appears the Lopezes would qualify. If so, they could receive health insurance for $71 per month apiece, or a combined $154, according to the Oklahoma Health Care Authority. It’s not clear whether Insure Oklahoma will continue beyond 2014. The federal government had planned to stop funding it at the end of this year because Oklahoma declined to make changes it had requested. The state recently announced it had obtained a one-year extension of the program, but its future remains murky. Lopez said he was aware of Insure Oklahoma but had never looked into it. So far, he said, his health care expenses have been minimal because the free clinic has absorbed most of the cost. But he plans to investigate his options soon. “I know I’ve got this problem, but I’m not doing too much about it,” he said. Katie Bolin works a 16-hour shift every Saturday as a home health-care nurse, helping other people deal with their aches and pains. But when she gets sick, she’s pretty much on her own.